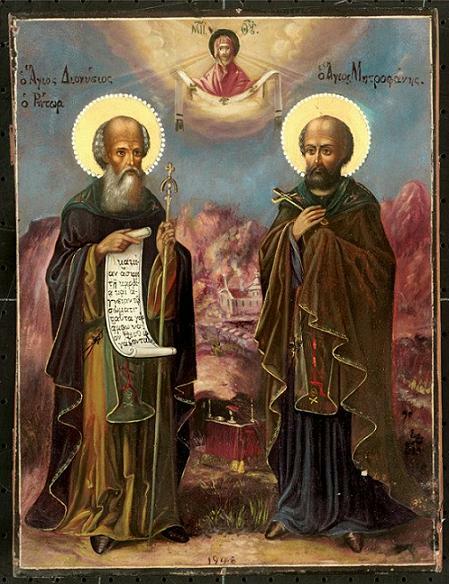 Saint Dionysius the Rhetor and his disciple St Metrophanes lived toward the end of the sixteenth century and the beginning of the seventeenth century, but it is not known where they were born. St Dionysius received the monastic tonsure at the famous Studion Monastery in Constantinople, where he and St Metrophanes lived. 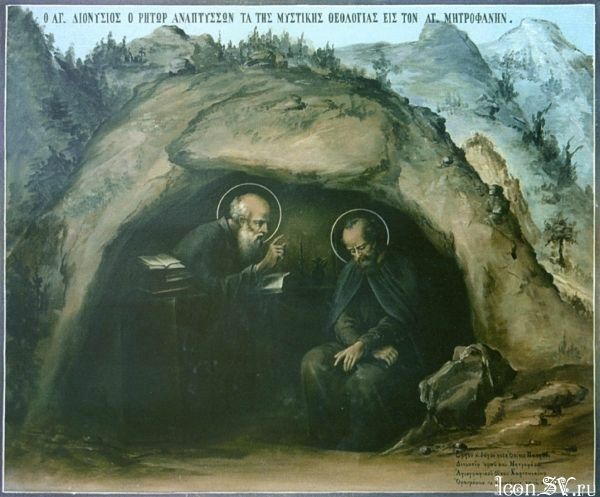 Desiring a more intensive life of prayer and solitude, the two saints left the monastery of their repentance and journeyed to the peninsula of Athos, establishing themselves in a cell near Karyes. There they devoted themselves to prayer, fasting, and vigilance. St Dionysius was distinguished for his virtue and wisdom, which drew many disciples to him. Training others in the monastic life left him with very little time for his own spiritual struggles, and with so many people around him his soul was not at peace. Therefore, St Dionysius and St Metrophanes proceeded into the desert of Mount Athos in search of even greater solitude. Somewhere between St Anne’s and Katounakia, they found a cave and made it their abode. This would be the future site of Little St Anne’s Skete, and they were the first to settle at this place. In that small and humble cave, they lived a godly life which was equal to that of the angels. In their spiritual struggles they fought against the stomach’s need for food, and against the body’s need for sleep. They restricted not only the types of food they ate, but also the amount they consumed at meals. By limiting the amount of time for sleep, they were able to devote themselves more to repentance and prayer. St Dionysius and St Metrophanes were esteemed as learned men, but they attained even greater wisdom in the true philosophy of monasticism, which has been called “a life according to the Gospel.” They made such progress in the monastic life, excelling in virtue and holiness, that they became teachers of many holy ascetics. Later, St Metrophanes, with the blessing of the Athonite Fathers and of his Elder St Dionysius, was asked to leave Mount Athos for a time in order to preach the Word of God in the neighboring villages. After he had fulfilled this obedience he returned to the Holy Mountain. St Dionysius wrote a book called KOUVARAS, which was a guide on how to benefit and train the brethren. The manuscript is preserved in the Skete’s library. St Dionysius taught the art of inner attention and mental prayer, and was himself proficient in them. He rendered many writings of the Holy Fathers into a simpler form of Greek so that ordinary people could understand them. Some of these have been printed in Greek theological publications in modern times. Many of his writings still remain unpublished, however. 2,000 services (including the service in honor of St Dionysius and St Metrophanes), Hieromonk Dionysius fell asleep in the Lord on October 6, 1606, and his disciple St Metrophanes reposed shortly thereafter. At Little St Anne’s, however, both St Dionysius and St Metrophanes are commemorated on July 9. A church was built in 1956 at the site of their cave, and was dedicated to these saints. According to Tradition, St Dionysius the Rhetor is to be depicted with straight posture, a wide forehead, a large mustache, and a square beard.